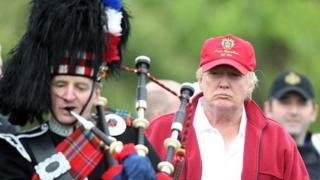 Donald Trump's mother, Mary Anne MacLeod, was born and brought up on the Hebridean island of Lewis but emigrated to New York to live a very different life. Mary Anne was one of tens of thousands of Scots who travelled to the US and Canada in the early years of the last century looking to escape economic hardship at home. 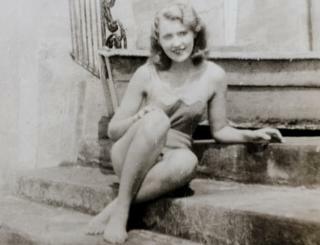 She first left Lewis for New York in 1930, at the age of 18, to seek work as a domestic servant. Six years later she was married to successful property developer Frederick Trump, the son of German migrants and one of the most eligible men in New York. The fourth of their five children, Donald John, as he is referred to on the islands, is about to become US president. 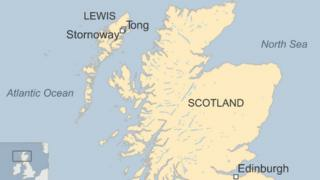 His mother was born in 1912 in Tong, about three miles from Stornoway, the main town on the isle of Lewis. Genealogist Bill Lawson, who has traced the family tree of Mary Anne MacLeod back to the early 19th Century, says her father Malcolm ran a post office and small shop in his later years. Economically, the family would have been slightly better off than the average in the township, he says. However, life during and after World War One, in which 1,000 islanders died, was very hard and many young people were leaving the Western Isles. Lewis had also suffered the Iolaire disaster in 1919 when 200 servicemen from the island had drowned at the mouth of Stornoway harbour, coming home for the first new year of peace. Mr Lawson says: "Mary Anne MacLeod was from a very large family, nine siblings, and the move at that time was away from the island. "The move by Viscount Leverhulme to revive the island had gone bust and there was not much prospect for young people. "What else could she do?" Mr Lawson adds: "Nowadays, you might think of going to the mainland but in those days most people went to Canada. It was far easier to make a life in America and many people had relatives there." 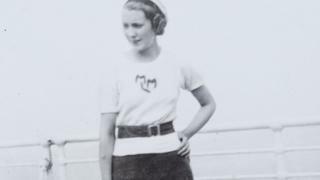 The genealogist says Mr Trump's mother was slightly different in that her sister Catherine, one of eight members of the MacLeod family to have emigrated to America, had moved from Canada to New York. 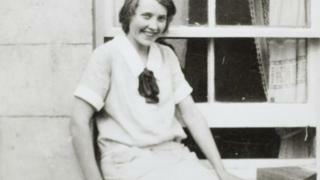 When Catherine returned to Lewis for a visit in 1930, her 18-year-old sister Mary Anne went with her to look for work. It appears that she found work as a nanny with a wealthy family in a big house in the suburbs of New York but lost the job as the US sank into depression after the Wall Street Crash. Mary Anne returned briefly to Scotland in 1934 but by then she had met Fred Trump and soon returned to New York for good. The couple lived in a wealthy area of Queens and Mary Anne was active with charity work. 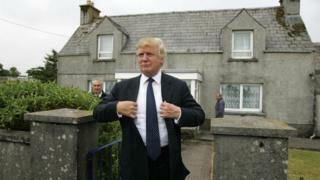 Donald Trump still has three cousins on Lewis, including two who live in the ancestral home, which has been rebuilt since Mary Anne MacLeod's time. All three cousins have consistently refused to speak to the media. John A MacIver, a local councillor and friend of the cousins, says: "I know the family very well. "They are very nice, gentle people and I'm sure they don't want all the publicity that's around. "I quite understand that they don't want to talk about it." Mr MacIver says Mary Anne MacLeod was well-known and much respected in the community and used to attend the church on her visits home. Mr Trump's mother became a US citizen in 1942 and died in 2000, aged 88. 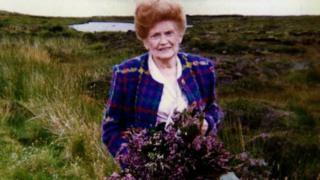 But she returned to Lewis throughout her life and always spoke Gaelic, Mr MacIver says. According to genealogist Bill Lawson, surnames are a relatively recent phenomenon on the islands and official records only go back to the early decades of the 19th Century. His research took him back as far as John Roy MacLeod, which in Gaelic is Iain Ruaidh, named for a tendency to red hair. Mary Anne Trump's paternal MacLeods came from Vatisker, a few miles further north of Tong. Her great-grandfather Alexander Roy MacLeod and his son Malcolm were thought to have drowned together while fishing in the 1850s. On Mary Anne's mother's side, the Smiths were among the families cleared from South Lochs area of Lewis in 1826. When is Donald Trump's presidential inauguration and who is performing? The period of the Highland Clearances on the mainland had largely missed Lewis but after the Battle of Waterloo in 1815 some of the better lands for sheep-grazing on the island were cleared of tenants. In most cases the displaced tenants were relocated elsewhere on Lewis rather than sent overseas. According to Mr Lawson, all four lines of Mary Anne MacLeod's maternal ancestry had been moved to Stornoway parish from elsewhere on the island as a result of the Clearances. His research also found another fishing tragedy when Donald Smith was drowned in October 1868 after his boat was upset in a squall off Vatisker Point. His widow was left with three children, of whom the youngest, Mary, Donald Trump's grandmother, was less than a year old. Mary succeeded her mother at 13 Tong but it was the smallest of the crofts in Tong. After her marriage to Malcolm MacLeod, they were able to acquire the Smiths' original croft of 5 Tong and move there. Donald Trump's mother Mary Anne was the youngest of their 10 children. Mary Anne Trump's billionaire son Donald visited the house in which his mother grew up, and his cousins in 2008. On that trip, the now president-elect said he had been to Lewis once before as "a three or four-year-old" but could remember little about it. It is estimated he spent 97 seconds in the ancestral home during his whistle-stop tour. At the time, he said: "I have been very busy - I am building jobs all over the world - and it's very, very tough to find the time to come back. "But this just seemed an appropriate time, because I have the plane... I'm very glad I did, and I will be back again." The president-elect was accompanied by his eldest sister Maryanne Trump Barry, a US federal judge, who has regularly visited her cousins on Lewis. Mr Lawson says: "If you want to celebrate anyone, you should perhaps celebrate Maryanne, who has done a lot of work for the island. "Donald arrived off a plane and then disappeared again. One photoshoot, that was it. "I can't say he left much of an impression behind him."